What Is the Security Behind EMV Chip Payments? Increased security and reduction of in-person counterfeit card fraud are major drivers for the ongoing migration to EMV chip payments in the U.S. However, the advanced security processes going on behind the scenes of a chip transaction may be confusing for stakeholders new to the technology. The EMV Migration Forum simplifies one of the fundamental security features of chip transactions – the cryptogram – in a new video tutorial released today. 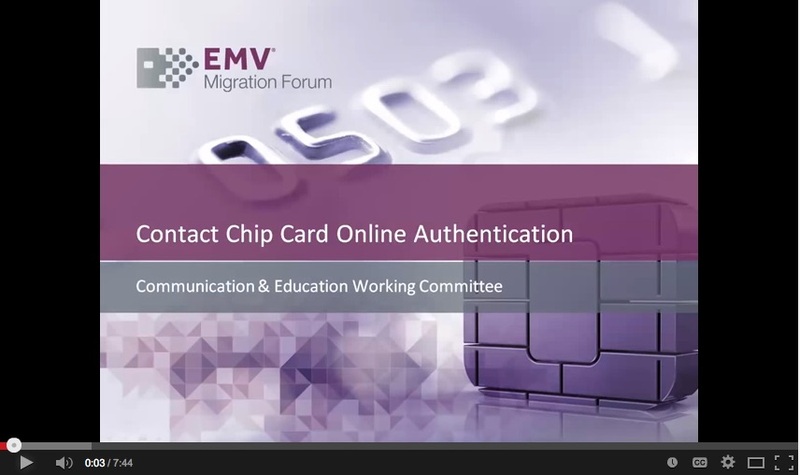 The video presentation, “Contact Chip Card Online Authentication,” is available for viewing at http://www.emv-connection.com/contact-chip-card-online-authentication. The visual, non-technical presentation describes the process of online authentication that occurs in every chip transaction. As a part of this process, the chip and card issuer communicate with each other to create cryptograms, or dynamically generated codes that are unique to the specific card and transaction. These cryptograms are essential components of the chip transaction that validate that the chip and the issuer in the transaction are genuine, not counterfeit. Use of chip cards has proven to be extremely effective at reducing in-person card fraud in countries that have deployed chip technology; for example, the UK and Canada saw reductions of 72 percent and 48 percent respectively. The U.S. is currently in the midst of migrating to chip technology, with 600 million cards expected to be in the market by the end of 2015. For more information on the U.S. migration to chip, visit http://www.emv-connection.com. The video presentation, “Contact Chip Card Online Authentication,” was developed by the EMV Migration Forum’s Communication and Education Working Committee and led by Brady Cullimore, director of the U.S. EMV project management office at American Express. For more information on the EMV Migration Forum working committees, visit http://www.emv-connection.com/emv-migration-forum/working-committees/. The financial transactions world is changing. Are you staying afloat?